There are a number of things that you have to buy as a golfing enthusiast: balls, clubs, tees, clothes, bags, putters, shoes, etc. 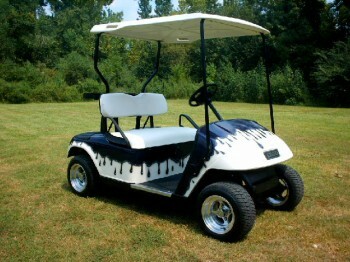 A golf cart battery that costs anywhere between $200 and $500 is also usually seen in the list of items to be bought. The aim of this article is to give you some tips on how to take proper care of golf cart batteries so that you don’t have to replace this costly item quite often. In fact, you can use the money to pay the green fees for a year or get yourself a driver! Here are some things that you can do help extend the life of the battery your electric golf trolley and bring down your overall expenses as a golf enthusiast. You have to strictly follow the instructions given by the manufacturer of the golf cart battery. It is very important to ensure that AGM (Absorbed Glass Mat)/deep cycle batteries are not run down completely before recharging them. In fact, the battery has to be maintained at the near full charge condition as much as possible. Devices that are capable of keeping the battery charged making use of solar power are available these days. You can take advantage of such devices to extend the life of your golf cart battery. 2. Maintain the water levels. You need to maintain the water levels inside the golf cart batteries to ensure that it stays in a good condition for a longer time. Also, it is important that you use only distilled or pure water when you top up the battery water level. This is because water that is highly alkaline or acidic can damage the battery and reduce its lifespan. In old batteries and those that have suffered some kind of damage, the water levels can become low. If this happens, the batteries may not charge properly and you may be forced to change the battery. A battery works to generate electrical charge on the basis of chemical reactions taking place in it. Rough handling of the equipment through rash driving of the golf cart and accidents that happen when carting the battery can seriously damage the batteries and they may not effectively generate charge and at times not generate at all. Also, you have to ensure that you don’t drop the battery. You have to always remember that your golf depends on its effective performance. Think of the situation when your golf cart breaks down miles away from the 19th hole and you are forced to get the help of the golf course staff to not only get back, but also bring the golf cart with you! Take proper care of the battery so that it can perform well. 4. Keep the leads clean. The battery provides the electric current required to run the golf cart engine and its ability to supply the right amperage will be hampered if the leads are old and rusted. Damaged leads and non-standard leads can also cause fire. You can prevent the failure of the golf cart engine by keeping the leads clean and replacing them when they become old. You will feel great and confident when you know that all the factors that contribute to the performance of your golf cart battery are in control. You will be in a position to focus on your game as the battery will not be a source of irritation any longer!